Shin was a relatively ordinary young guy until a MYSTERIOUS STRANGER from SPACE appeared from nowhere and handed him the KEY TO THE POWER GALACTIC before escaping, chased by terrifying beings from another dimension. Shortly thereafter Earth was invaded by a massive force of alien beings from all corners of the galaxy, on a hunt for the KEY. 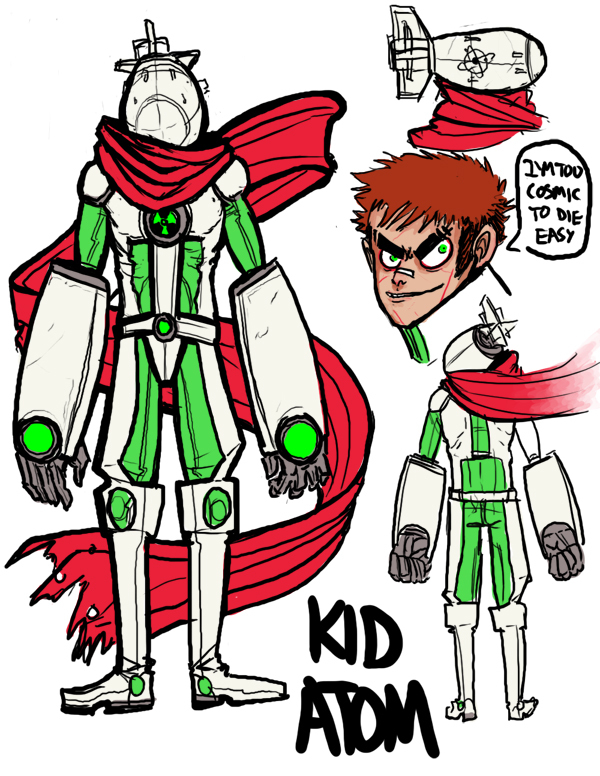 Using the power of the KEY allowed Shin to transform into KID ATOM and defend the city against the alien menace. He is currently trying to find the stranger that gave him the KEY to guard, and find out what it's true power is and why he was selected to guard it. As KID ATOM, Shin can shoot beams of atomic energy from his eyes and his MEGATON GAUNTLETS that cause incredibly destruction. He is also able to jump incredibly distances, punch whole buildings asunder, and kick people into the moon. His gauntlets have all the power of an atomic bomb inside of them. Shin is also able to harness his full power to cause explosions of any size or magnitude, up to atom bomb sized. Doing so is strenuous and causes massive collateral damage, so it's usually his last resort.